Seeing as how it was my second trip to the DMV in one day, you can understand how my patience was already quite thin. I had spent the day running errands, and my first trip to the DMV ended in failure as I was told I needed my wife’s signature on the form that had to be submitted. Upon entering the room where you are reduced to a number and are forced to wait your long awaited turn, I was faced with another dilemma. The number I was supposed to take to determine my place in line was in a machine a foot or two above my highest reach. I was forced to ask for help. What’s your weakest ability? For some it is math. I know tons of people who hate working with numbers. Maybe it is writing or public speaking. Pick something you hate or are terrible at doing. Got it? Now, for the rest of your life you have to wear a t-shirt that tells the world how incapable you are at the thing you just picked. Got a bad feeling in the pit of your stomach? Good…cause now you have an inkling of what it is like for me to ask for help. I live in a body with no arms and deformed legs. The ways in which I struggle – reaching high objects, opening doors, carrying things, etc – are shown to all those around me the moment I enter their presence. I have no ability to hide my disability. I’m always on stage. So, you may comprehend why I generally choose to ignore my problems. After all, if I focused on my lack of abilities, I would be down in the dumps all the time. Sometimes, though, life forces me to acknowledge my lack of arms. You’d think that having to ask for help as often as I do, that I’d be used to it by now. It doesn’t seem to ever get easier, though. A man standing near the take-a-number device made eye contact with me, I swallowed my pride, and asked if he would get a number for me. After all, they were already serving number 61, and I didn’t want to this to take any longer than it was already destined to as the next number in the machine was 89. The man smiled, grabbed a number, and then did something unexpected. Instead of giving me the next number in the machine, he gave me the ticket he had been holding, and took the new number for himself. I looked at the number he gave me…62. “You’re next.” he said as smiled and walked away. 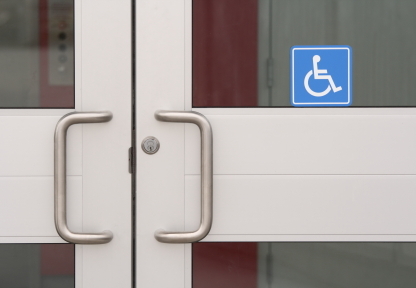 In asking for help, I admit my imperfection, my inadequacy, and ultimately, my handicap. And, sometimes, I not only get the assistance need, but receive a blessing for being just the way I am. Posted by Chet McDoniel Posted in Disability Speaker Posted in September 17, 2010 | Comments Off on 38 Degrees, in September? 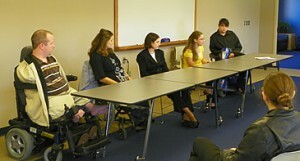 Just over a week ago, I was asked to speak to students and faculty at Harper College just outside of Chicago, IL, on disability awareness. I told my story of growing up in a body with no arms, and gave the attendees a few tips on interacting with people in wheelchairs along with a few ideas on how to live a happy life. The space they had me in is called a “black box” theater which provided a very intimate setting. After I spoke, we had a great Q&A time in which the students and faculty asked me questions that ranged from from how I met my wife to how I became a disability awareness speaker. The group was fantastic, and even though it was a very short trip, I really enjoyed getting to be at Harper College for a few hours. 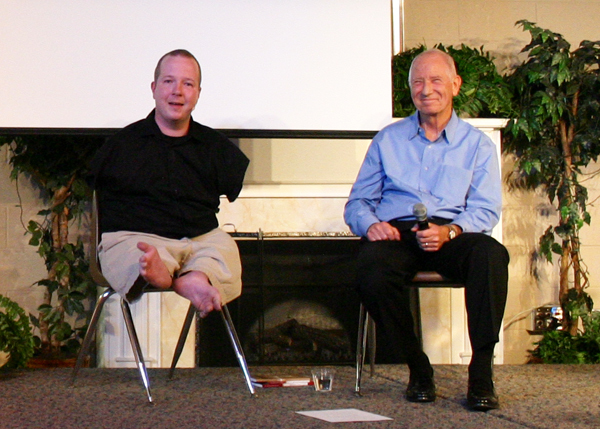 I love the opportunity to teach others about my experiences in what the world sees as a “handicapped body.”. Many times, appearences can be very deceiving. All in all, judging from their reactions, the attendees at Harper College were entertained and enlightened.